I heard that the AAPC has a beta compliance testing program underway. I have an existing compliance credential and would love to test during this beta period. How would I get invited to participate? I am not aware of any, but if there's beta testing, I too, might like to be involved. Previously there've been invites to me for certain beta tests. Anyone from AAPC have information to share? I received an invitation to apply for the Beta test, but after submitting a request to take the test, was told that AAPC had an overwhelming response to the invitation and were limiting the opportunity to a selected few. My question about this compliance credential is whether it is a core certification or a specialty certification. Any AAPC response? First, thank you for your interest in the new AAPC Compliance credential. We are currently in the process of completing the beta examination, but as Jenny noted, we had an overwhelming response and needed to limit the number of individuals taking the test. At this time, we are not accepting any additional applications. The Certified Professional Compliance Officer (CPCO) is going to be a core credential and we plan to release the exam in mid-January 2011. 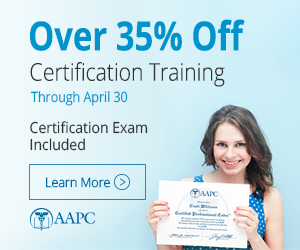 You can find out more about the credential on the AAPC website in the Certification tab. Does anyone know what the study reference will be for this certification. I loved the Medical Auditor Book for the CPMA exam. What is a good reference book for this exam? They posted a long list of study materials. I'm wondering if once beta testing is complete, if folks will share their testing experiences here. This credential is long overdue for those of us who have been loyal AAPC members, but have been forced to pursue compliance credentials through other organizations. I'm very excited over the prospect of seeking this credential. Good luck to all and thanks to AAPC for filling this need! New practice and existing patients?